Time Capsule - Adam Smith, Esq. A full 26 of the 50 (52%) firms were New York City-based. 7 of the 50 (14%) failed outright and no longer exist. 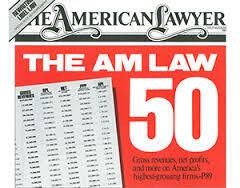 12 of the 50 (24%) still exist under the same name but have fallen out of the AmLaw top 50. And surprisingly, at least to me, only three of the 50 (6%)—Fulbright & Jaworski (Norton Rose) Rogers & Wells (Clifford Chance), and Roseman Colin (Katten Muchin)—actually disappeared through merger. I don’t count Dewey Ballantine and LeBoeuf Lamb, since their merger was merely prelude to and accelerant of outright failure. This somewhat belies the impressionistic conventional wisdom that mergers have been the primary driver behind the changing composition of the AmLaw lineup. To be sure, many of the firms that survive in continuous and recognizable form—just for example Jones, Day, Reavis & Pogue; Morgan, Lewis & Bockius; and Mayer, Brown & Platt—have experienced their fair share of mergers, but my point is that our fuzzy intuition that mergers have radically changed large and small firms alike appears from this leading sample of firms to be unjustified by the facts. Turning from the 1985 listing to the 2016 AmLaw top 50 firms, what if anything do the most current members of that high precinct have in common, if anything? The first and most obvious observation is that many firms that were there 31 years ago are still there today: Latham, Baker & McKenzie, Jones Day, Sidley, Morgan Lewis, and many more. Third, many of the newcomers to the top 50 are formerly regional or city-killer firms that have embraced national and international strategies: Greenberg Traurig-14, Reed Smith-21, K&L Gates-24, Paul Hastings-25, King & Spalding-27, Squire-30, Orrick-31, Dechert-34, and more. Fourth, New York is still the #1 city by headquarter count, but down from 26/50 to 14/50. Fifth, the number of firms that have their headquarters in nowhere they care to claim specifically (shall we call them “polycentric?”) actually outnumber those in New York: 18 is the count I come up with, although some firms in this category have undeniable strong historic roots in one metropolitan area. I won’t here venture into all the other changes under the skin of the shockingly raw tabulations The American Lawyer provides, but we all have lived through and know well phenomena such as the invention of the non-equity partner tier, changes in governance, and so on. Just a time capsule on which you can reflect at your leisure for larger lessons.